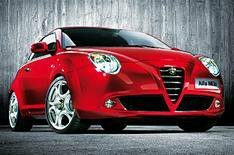 It's official - Alfa's supermini named | What Car? Alfa Romeo's new supermini finally has a name - the Mi.To. The car, which will go on sale in the UK in early 2009, has endured a protracted naming process, beginning life with the codename Junior, then being branded Furiosa following a public competition, before finally being christened the Mi.To. The name Mi.To is derived from the car's origins in Alfa Romeo's Milan-based design studios and Turin's construction plant. Alfa Romeo says the Mi.To takes some of its styling cues from the 108,000 8C Competizione supercar. These include frameless side windows, the shape of the front end, and the headlights and LED tail lights. The three-door Mi.To is based on stablemate Fiat's Grande Punto platform, although the suspension will be more sophisticated to improve its ride and handling. Stability control will be fitted as standard. It will be launched with a choice of four turbocharged petrol and diesel engines, ranging from 90bhp to 155bhp. A hot version should come early in 2009 with a higher-powered engine. Drivers will be able to select one of three driving modes, which will change the way the engine, brakes, steering, suspension and gearbox operate. These are Dynamic for sports driving, Normal for town driving and All-Weather for when road conditions are tricky. The car will go on sale in Europe in July, so there's a chance it could be displayed at the British motor show that month. It's thought that the Mi.To will cost from around 12,500.